Moët Hennessy’s new Chinese wine was ‘a logistical nightmare’ and far more expensive to produce than anything else in the group’s wine portfolio, including Château d’Yquem. According to the president of Moët Hennessy Estates & Wines, Jean-Guillaume Prats, making the wine – which comes from extremely remote vineyards on the edge of the Tibetan plateau – has been immensely costly and complicated, but also extremely rewarding. Justifying the US$300 retail price of the wine, named Ao Yun (which loosely translates as ‘flying above the clouds’), Prats told the drinks business, “It is the most expensive product to produce in our portfolio – it costs far more to make than Yquem”. Prats chose to reference Yquem because the prized Sauternes is famously expensive to make, not only because it is produced in tiny quantities using hand-picked berries that are selected during as many as 10 passes through the vineyards, but also because it is only created in vintages when the conditions favour the spread of botrytis, otherwise known as noble rot. 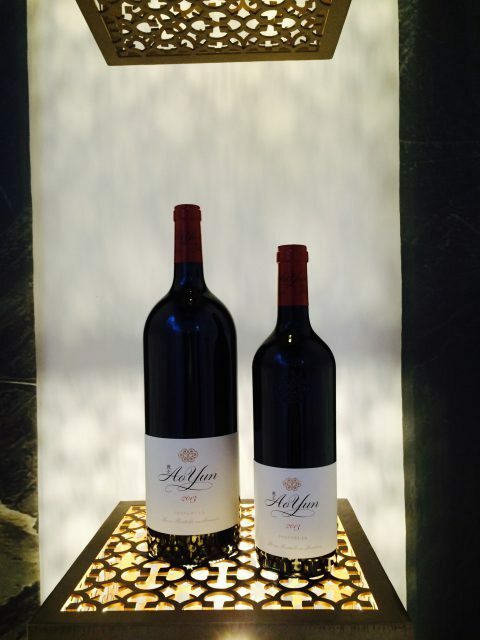 Speaking further about Ao Yun, he said that making the wine, which is a blend of 90% Cabernet Sauvignon and 10% Cabernet Franc, was “a great human challenge and a logistical nightmare”, adding that the product was only made possible due to the “support and power” of Moët Hennessy. Making the wine so expensive and challenging to produce was primarily the location of the vineyards. Situated between 2,200m and 2,600m above sea level in Adong, which is located in the Chinese province of Yunnan in the Himalayan foothills, the vineyards are a 4.5 hour journey from the nearest town, called Shangri-La, which includes a drive along a mountain pass reaching 4,000m. “The logistics are just so difficult,” said Prats, pointing out that not only is the journey to the vineyards long and treacherous due to the altitude and heavy snowfalls – and the lack of oxygen at such heights – but also because it’s necessary to have your own transport: there is no rental car facility at Shangri-La airport, or taxis. As for the management of the vineyards, this is made difficult by the cultural and language barriers. The locals, who don’t drink, or speak English, can only be managed through the local mayor. The production of the wine, both in the vineyard and cellar, would make many ‘natural’ winemakers look interventionist. Prats told db that vineyard soil management is done by yaks and the vines are irrigated using diverted glacial meltwater, because there is no electricity for pumping water into drip irrigators. Furthermore, due to the lack of power, everything was done manually in the cellar for the inaugural vintage, which comes from the 2013 harvest [from 2014 onwards electricity was installed in the winery]. “The winemaking is extremely basic: there was no temperature control, the bunches were de-stemmed by hand, we did the delestage [rack and return] manually, the analysis was done by taste, and the wine was both vinified and aged in baiju amphora,” recorded Prats. The wine from 2013 has seen some oak influence however, but, because the barrels arrived six months after the harvest, Ao Yun 2013 only spent half a year in 100% new oak. “In my previous life I was obsessed with precision using the most-advanced equipment and this is the other way round – there is no intervention at all,” he commented, acknowledging the marked contrast between overseeing the production of this wine as opposed to his past projects – Prats was formerly winemaker at Bordeaux second growth Cos d’Estournel, which his father Bruno owned until 1998. But what Prats has created is an impressive, if expensive, Bordeaux blend from China. And what about the possibility for greatness? “To be able to produce such a great wine with no intervention shows me that the potential is huge,” he stated. He also stressed that the age-worthiness of the wine is impressive due to its high levels of acidity, which in turn are a consequence of the short daylight hours and cold nights. “The pH is 3.55 naturally, so it will age very well, and that’s because we lose the light [behind the mountains] at around 3.30pm, and within minutes the temperature drops by 10-15 degrees Celsius,” he recorded. This also allows for a long, slow ripening, which produces fine tannins, said Prats, comparing the effect to making meat tender by cooking it for an extended period at a low temperature. “Because of the shade from the mountains we are 160 days between flowering and harvest, compared to 130 days in Napa,” he noted, adding that the region receives 4-6 hours of sunlight daily, around half the usual amount. For the inaugural vintage, 24,000 bottles have been released from a little less than 28 hectares of vineyards – yields are around 25hl/ha – but the winery built by Moët Hennessy in the region has the capacity to produce 50,000 bottles, which Prats hopes to reach in the future. Finally, Prats told db that he has made a small amount of a ‘lighter’ second wine from 2013, which he has yet to release, or decide what to do with, and he has also made 6,000 bottles of a barrel-aged Chardonnay. As previously reported by db, Prats has high hopes for the Ao Yun red, comparing it to Australia’s most famous and collected label. “My dream is that it’s a new Grange Hermitage… a wine that’s been created with no rules or boundaries,” he said. • Ao Yun is made in a winery built by Moët Hennessy in the village of Adong. • The area is offically called the Three Parallel Rivers, referring to the Yangtze, the Mekong and the Salween. • However, Ao Yun’s label features the evocative name of the nearest town, Shangri-La (the paradise imagined in 1933 by James Hilton in his novel Lost Horizon). • It is a UNESCO World Heritage Site. • The wine comes from vines at an average altitude of 2,500m in the foothills of the Himalayas. • The vineyards are found just below the sacred Meili Mountain. • According to Moët Hennessy, the climate is similar to Bordeaux but with lower night-time temperatures, stronger UV and a drier growing season. • Unlike Ningxia – home to several high-end Chinese wines – the vines in Adong do not need to be buried in winter. • The vineyards are farmed organically, and everything is done by hand (or yak). • The soils are derived from weathered granite from the mountains above. • The grapes from Ao Yun come from 314 blocks across 27.7 hectares. • The total vineyard area of the Three Parallel River region is 500 hectares. • The first vines in the area were planted by Jesuit missionaries in 1846. • However, the vineyards used to make Ao Yun were planted in 2002 following Chinese government investment in viticulture. • The aim was to re-instate viticulture in the area, as well as develop the upper Mekong valley for agriculture. • The government chose to plant mostly Cabernet Sauvignon and Chardonnay grapes, although there is also Merlot, Cabernet Franc, Petit Verdot and Carmenere in the area. • At the same time, this remote area was provided with road access. • The vines are owned by local farmers and leased by Moët Hennessy. • The first vintage is 2013, and the production is 24,000 bottles. • Ao Yun is being launched internationally with a price tag of US$300. So the not so subtle message here is that Yquem is underpriced.